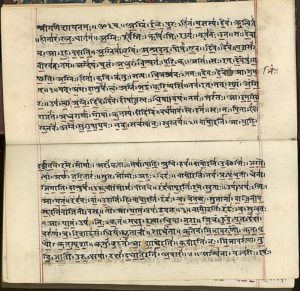 Ancient India Vedas: The Vedas implies ‘knowledge’ in Sanskrit is a large body of texts. These texts originated in ancient India. The Sanskrit word Véda “knowledge, wisdom” is derived from the root vid- “to know.” These texts are composed in Vedic Sanskrit and constitute as the oldest layer of Sanskrit literature as well as the oldest scriptures of Hinduism. According to the Hindu tradition, the Vedas are ‘apauru?eya’ or “not of human agency.” Since they were supposed to have been directly revealed, they were thus called as ‘Shruti’ meaning “what is heard.” Some selected Vedic mantras are still recited at prayers, religious functions and other auspicious occasions in contemporary Hinduism. The various Indian philosophies and sects have taken differing positions on the Vedas. Indian philosophy schools citing the Vedas as their scriptural authority are classified as “orthodox” or Astika. On the other hand, the other traditions, particularly Buddhism and Jainism, did not regard the Vedas as authorities. They are referred to by traditional Hindu texts as “heterodox” or “non-orthodox” or Nastika School. Apart from Buddhism, Jainism, Sikhism as well as Brahmoism many non-Brahmin Hindus in South India also did not accept the authority of the Vedas. Certain South Indian Brahmin communities such as Iyengars considered the Tamil Divya Prabandham or writing of the Alvar saints equivalent to the Vedas. In most Iyengar temples in South India, the Divya Prabandham is recited daily along with Vedic Hymns. 1. The Samhita actually means “collection” in Sanskrit. They are actually collections of metric texts or “mantras”. There are four “Vedic” Samhitas: the Rig-Veda, Sama-Veda, Yajur-Veda, and Atharva-Veda. This is the oldest layer of Vedic texts dating to around the 12th to 10th centuries BC, apart from the Rigvedic hymns. The Rigvedic hymns were probably essentially complete by 1200 BC, dating. The complete corpus of Vedic mantras consists of some 89,000 padas, of which 72,000 occur in the four Samhitas. 2. The Brahmanas are prose texts that discuss the solemn sacrificial rituals as well as comment on their meaning and many connected themes. Each of the Brahmanas is associated with one of the Samhitas or its recensions. The Brahmanas may either form separate texts or can be partly integrated into the text of the Samhitas. They may also include the Aranyakas and Upanishads. 3. The Aranyakas, or the “wilderness texts” or “forest treaties”, were composed by people who meditated in the woods as recluses. They constitute the third part of the Vedas. The texts contain discussions and interpretations of dangerous rituals and various sorts of additional materials. 4. Some of the older Mukhya Upanishads like Chandogya, Katha etc. 5. Certain Sutra literature, that is. The Shrautasutras and the Grhyasutras- The Shrauta Sutras are often regarded as belonging to the Smriti, and late Vedic in language and content. These formed a part of the Vedic Sanskrit corpus. The composition of the Shrauta and Grhya Sutras around the 6th century BC marked the end of the Vedic period. Also at the same time, the beginning of the flourishing of the “circum-Vedic” scholarship of Vedanga introduced the early flowering of classical Sanskrit literature in the Mauryan and Gupta periods.